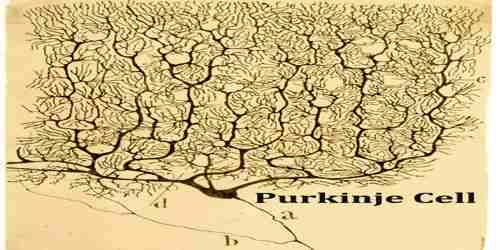 Purkinje cell is a large, densely branching neuron in the cerebellar cortex of the brain. These cells were first discovered in 1837 by Czech physiologist Jan Evangelista Purkinje. They are characterized by cell bodies that are flasklike in shape, by numerous branching dendrites, and by a single long axon. Most Purkinje cells release a neurotransmitter called GABA (gamma-aminobutyric acid), which exerts inhibitory actions on certain neurons and thereby reduces the transmission of nerve impulses. These inhibitory functions enable Purkinje cells to regulate and coordinate motor movements. Purkinje cells are found within the Purkinje layer in the cerebellum. Purkinje cells are aligned like dominos stacked one in front of the other. The structure of the plasma membrane of Purkinje cell dendrites was examined in weaver and staggerer mutant mice. 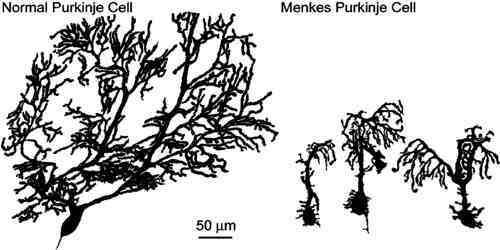 Purkinje spines in weaver mice have clusters of intramembrane particles which resemble those at normal synapses with parallel fibers, even though no parallel fibers are formed in this mutant. The cerebellar cortex is made up of three layers, consisting of an outer synaptic layer (also called the molecular layer), an intermediate discharge layer (the Purkinje layer), and an inner receptive layer (the granular layer). Sensory input from all sorts of receptors is conveyed to specific regions of the receptive layer, which consists of enormous numbers of small neurons (hence the name granular) that project axons into the synaptic layer. Most Purkinje cells are GABAergic and therefore exert strong inhibitory influences upon the cells that receive their terminals, all sensory input into the cerebellum results in inhibitory impulses’ being exerted upon the deep cerebellar nuclei and parts of the vestibular nucleus. Purkinje cells show spontaneous electrophysiological activity in the form of trains of spikes both sodium-dependent and calcium-dependent. P-type calcium channels were named after Purkinje cells, where they were initially encountered, which are crucial in cerebellar function. 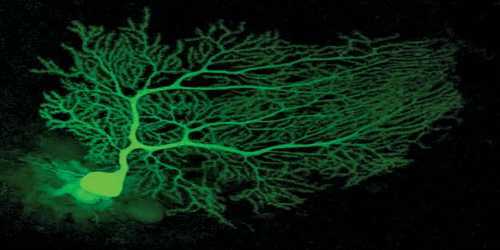 The loss of or damage to Purkinje cells can give rise to certain neurological diseases. During embryonic growth, Purkinje cells can be permanently destroyed by exposure to alcohol, thereby contributing to the development of fetal alcohol syndrome. The loss of Purkinje cells has been observed in children with autism and in individuals with Niemann-Pick disease type C, an inherited metabolic disorder.